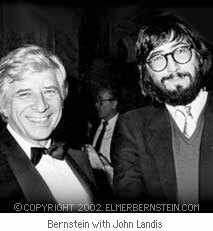 Sometime in the late 1970s and early 1980s, Elmer Bernstein managed quite skillfully to reinvent himself and thus be discovered by a whole new generation of movie goers. Articles again began to appear about him in music and film trade publications, like Premiere. And if the readers hadn't heard or seen The Man with the Golden Arm, The Great Escape, or The Magnificent Seven, they started taking notice of the composer behind American Werewolf in London, the Blues Brothers, Heavy Metal, and The Black Cauldron. Here are some highlights from Elmer's New Wave period. For this uproarious spoof of air disaster movies, Elmer Bernstein early on decided that the music score for this comedy should take itself very seriously; in other words, it should be scored as if the composer isn't in on the joke and is making an earnest attempt to write hugely dramatic cues to support the disaster movie formula. The approach worked famously, and even though I can't recommend the orchestral soundtrack as a standalone entertainment, I can say that within the film, Elmer's masterfully overwrought score adds immeasurably to the Mad Magazine-inspired comedy. The score also pokes fun at other movie genres: we get a snippet of John Williams' tuba motif from Jaws as we see an airliner's tail weave in and out of the clouds like a shark's dorsal fin. Most movie goers remember Ray Parker, Jr.'s infectious Ghostbusters pop tune ("who ya gonna call? "), and some also know of the lawsuit leveled against the singer by Huey Lewis, who claimed (quite correctly) that the tune plagiarized Lewis' own hit song, I Want a New Drug. I don't recall how the lawsuit was settled, but the Ray Parker song is a memorable component of this 80s mega hit comedy, which is #28 on American Film Institute's list of the 100 best comedies. EB's musical score is also top-notch, and shows the whimsical side of the composer. The score prominently features the Ondes Martenot--an oscillating electronic instrument that was the precursor for the modern synthesizer. Developed in 1928 by Maurice Martenot, the Ondes sounds similar to the Theremin, which was invented a decade earlier and which is no doubt familiar to fans of Bernard Herrmann (The Day the Earth Stood Still) and The Beach Boys (Good Vibrations). Like the Theremin, the Ondes produces an eerie oscillating tone reminiscent of fingers delicately passing along the rim of a crystal wine glass. Bernstein uses the Ondes to good effect here, employing it to accentuate the unpredictable behavior of the mischievous ghosts lurking in hotel hallways and ballrooms. A Word about Song Scores. Remember that the 80s ushered in the era of song scores--movies that had limited underscoring, but lots of randomly placed pop tunes. (This trend continues unabated today.) Elmer had much to say about this unsettling trend, but sometimes the approach simply works, although it is not always clear why. For example, one of the funniest scenes in Ghostbusters comes when Bill Murray, Dan Aykroyd, and Harold Ramis confront their first seemingly innocuous ghost in the corridors of the public library (accompanied by EB's leitmotif). When the female spirit suddenly transmogrifies into a hideous, wailing creature, the Bus Boy's Cleanin' Up the Town kicks in as the Ghostbusters run like Hell out of the building. The song--driven by a great boogie-woogie piano, plays like frenetic dance hall music, making their escape even funnier. Based on a novel by Chaim Potoc, The Chosen is a vastly under-appreciated film with an equally under-appreciated score by Elmer Bernstein. As a thought-provoking and often intellectual film about the two Jewish teenagers growing up in Brooklyn during WWII, this film easily got lost amid blockbusters like Raiders of the Lost Ark, Star Wars sequels, E.T., Top Gun, and Crocodile Dundee. But that's okay, because you can now see it on DVD and it is well worth it. Elmer's music underscores the two central conflicts in the film: one between two cultures (Hassidic and Zionist Jews) and one between a brilliant young man (Robby Benson) and his cold and distant Rabbi father, played with restraint and subtlety by Rod Steiger. Using a chamber-sized orchestra, Elmer's music richly conveys the Hebrew's historical fight for a homeland, the revered traditions and laws that have defined a religious culture for thousands of years, and the heroism of a young man who must break free of those traditions to find his own path. EB's main theme is as impressive a work as John Williams' well respected theme for Schindler's List, scored 11 years later. The Chosen's central leitmotif begins with a beautiful Hebrew melody and harmony carried by two violins playing in high register. As the theme repeats, delicate woodwinds embellish the arrangement, leading to a second section covered by harpsichord and balalaika, which evokes Russian folk music of the early 20th century. The piece concludes with a final arrangement of the main theme, demonstrating beautiful counterpoint writing and featuring Elmer's signature piano arpeggios. 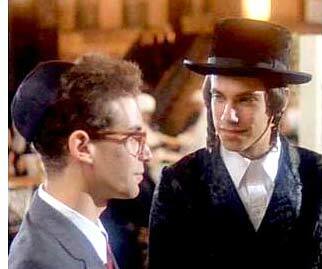 At the close of the film, this theme is played under the voiceover spoken by Reuven (Barry Miller), who reflects on his friend Danny's (Benson's character) reconciliation with his father and decision to study psychology rather than become a Rabbi. Elmer's music, combined with this narration, reaches us on a very deep emotional level, but not in a heavy handed way. Way back before digital music revolutionized our ability to listen before buying, one of the more risky businesses of the avid soundtrack collector was to buy soundtrack albums containing unfamiliar film music. Of course, this practice was dictated by the 50/50 rule, whereas half the time the LP would offer maybe one or two gems, the other half of the time six or seven. Back in 1988, I purchased Varese Sarabande's Screen Themes: Original Soundtracks and Themes simply because it contained an unfamiliar Bernstein cue, the theme from a little character-driven film called Da! Sandwiched somewhere between Beeltejuice and Die Hard, the theme to Da! provided 3:28 of musical enchantment for me. The piece begins with a simple but very pretty left-handed piano figure (F to Bbmaj7 repeated, if my turntable's RPMs are calibrated correctly) and is joined by the Ondes Martenot providing a beautiful melody. This leitmotif drifts briefly into a melancholy passage covered by the electronic instrument, harp arpeggios, and cellos then segues gently into a lovely chamber orchestra passage that evokes a sense of hope and optimism. The piece ends as it began, with the piano and Ondes reprising the central theme. Only later did I get a chance to see Da!, a charming film about a son's reconciliation with his cantankerous old Da (Irish term of endearment for father), even as he travels across the pond to attend his father's funeral. For Charlie (Martin Sheen), Da (Barnard Hughes) becomes a ghostly presence, allowing the two to unravel, sometimes quite humorously, their complicated relationship through dialog and flashbacks. It was a treat to experience the film with EB's score, and it proved once again how well Bernstein can interpret the nuances of drama and comedy and convey them with music. The film is well worth checking out. The chemistry between Sheen and Hughes is pitch-perfect.